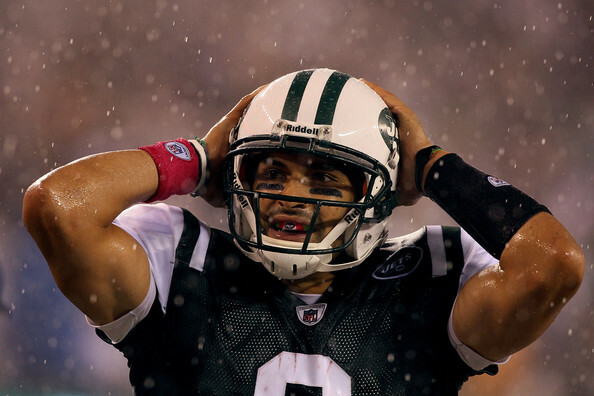 New York Jets Quarterback Mark Sanchez is an astute leader. Earlier this year he instituted a financial penalty system against himself for every time he exhibited negative body language. It seems that during his rookie year (2009 – 2010), Sanchez constantly gave negative vibes to his teammates and coaches via his critical body language. All great leaders know the power of nonverbal communication. It will dramatically help you or hurt you. Sanchez is the field general. He doesn’t want his teammates feeling that he’s always blaming them for a bad play, poor execution, or a missed opportunity. This self-deprecating and very public improvement system is a profound example of great leadership and transparency. By putting himself on the penalty block, he holds everyone else to a higher standard without bringing attention to teammates who are probably much more guilty of body language gaffes and poor attitude displays than he ever was. He’s making those around him better while at the same time he’s improving his own game. 1. Invite constructive criticism. Take an example from Mr. Sanchez and have a small group of friends, family, or co-workers critique your nonverbal communication and fine you for every infraction. The fine doesn’t have to be large; you could even institute a fine jar to add a quarter every time you have an infraction. This will help to create and reinforce feedback loops, which will help to make you more self-aware. 2. Study nonverbal communication informally and formally. Reading books, taking classes & courses (online and in person) as well as listening to audio-books are all great ways to increase your knowledge and skill in interpreting others’ body language. Seeing signals in others will make you more aware of your own tendencies. 3. Practice “Breathing Awareness.” The practice of focusing on a subconscious physiologic act, such as breathing, will tend to make you aware of other subconscious acts, such as nonverbal communication. I strongly suggest doing this in a dark room for 10 minutes, twice daily. It’s magic. 4. Sketch faces. Leonardo da Vinci felt that everyone should endeavor to draw, paint, or sculpt – not so they could be artists, but so they would become more observant. If you practice drawing faces a couple times a week during your lunch hour, distinctions will jump out at you that were previously lumped together in your mind. Remember, you don’t have to be anywhere close to perfect, just draw on a regular basis. 5. Watch interviews on TV with the sound off. This will heighten your awareness of the subtle aspects of body language that you may have previously glossed over. Take notes too. This is also a fantastic exercise for actors. There are lots of people in leadership positions, but that alone certainly doesn’t constitute leadership. However, too many act like it does. Sanchez is the real-deal. Go Jets! Dr. G. “Jack” Brown is a Board-Certified Physician and a Body Language Expert. He has studied, taught, and used body language all of his adult life. He welcomes the opportunity to coach, consult and provide keynote speaking to corporations, associations and leaders across North America. You can visit his blog at BodyLanguageSuccess.com and contact him at Jack@BodyLanguageSuccess.com and 702-239-8503. This entry was posted on Tuesday, November 23rd, 2010 at 12:53 pm and is filed under Leadership. You can follow any responses to this entry through the RSS 2.0 feed. You can leave a response, or trackback from your own site.